George Koutsoyannopoulos has a round, friendly face that belies the seriousness of what he is telling me, one arm on the steering wheel of his “Volcan Wines mobile,” the other gesturing over me towards the passenger side window as we ride up the twisting, winding passage towards one of Santorin’s higher points. We’re on our way to lunch at the local taverna; a Greek lunch, mind you – the kind that is of Homeric epic proportions even by European standards. It’s the kind of lunch that will last hours and showcase the best local cuisine that the island has to offer, the kind of lunch where you might just forget how to walk by the time it finally concludes. Typical day at the office, right? From the vantage point of the front passenger-side window, I don’t see vineyards in the valley below as it stretches out to the rocky beach and then the Aegean; I see an airport. George is a brave man. I know this not because he is driving recklessly – he isn’t (in fact, his driving, like the pace of just about everything else on this gorgeous volcanic oasis, can best be described as “laid back”). 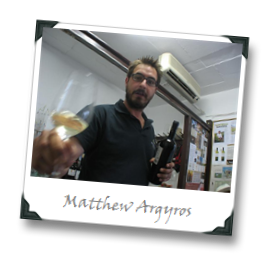 I know it because he is one of the driving forces behind the island’s Wine Museum, which chronicles the history of Santorini’s viticulture from 1660 through the 1970s. For one thing, the museum, while an informative treasure trove of the unique and ancient story of viticulture on Santorini, is underground and populated with some of the eeriest animatronic humanoid automatons I’ve ever seen – there is no way I could walk through it at night without totally losing it in an apoplectic, fetal-positioned mess of abject fear. More importantly, George’s investment in the museum is a brave gamble, part of a battle being fought to protect the island’s vineyards – and the history of Santorini’s wine culture, itself a miracle of human ingenuity vs. the forces of nature – from extinction. The greatest threat to the way of the wine on this most-beautiful of all of Greece’s Aegeanic treasures? 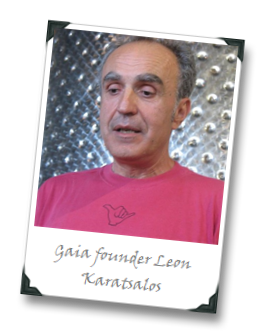 In contrast to George, Leon Karatsalos, one of the founders of Gaia Wines has a serious face (though in fine Greek fashion he is no less friendly or open as George). Tasting through Gaia’s solid offerings of racy Assyrtikos at their winery – located adjacent to an outdoor pool-side beach disco (complete with cages for the more adventurous dancer), and facing that same rocky beach to which George gestured on our upward luncheon drive. And, incidentally, a stone’s throw from that airport that represents in so many ways the strange tension between the bounties of wine and tourism on the island – Leon painted a similarly serious picture of the threat to Santorini’s wine future. “Greece unfortunately doesn’t have such a good reputation for good wine” he told me, when I asked about the challenges facing the wines of Santorini in the International marketplace. “Most of the wine shops in Greece are not very educated; they sell the wine at a higher price than the supermarkets.” But an even bigger challenge might be facing those wines in their own homeland. “Everyone is interested to sell their land for building, not vineyards” he added. The reason that Greece might seem slow out of the gate in increasing its international wine profile is that it first needs to secure a more stable future for the production of wine on its own soil. Since the 1960s, the hectares of vines on Santorini has roughly halved, as more and more land is devoted to the shops and hotels needed to cater to the island’s international visitors – they’re mostly y coming for the view, not for the wine. 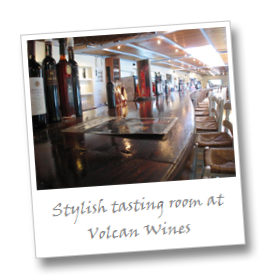 Hence the battle between winemaking and tourism for what amounts to part of Santorini’s land and its soul. Boutari – one of the largest Greek wine producers, brought both a modern touch and modern equipment to what had largely been small, traditional winemaking practices on Santorini. The biggest change, of course was the advent of (relatively) stable electricity on the island, which didn’t arrive until the 1960s but did mean that refrigeration could be used – which in turn meant cooling, stainless-steel fermentation, and and making modern winemaking styles possible, thus eliminating the oxidative qualities prevalent in the majority of the island’s wines . 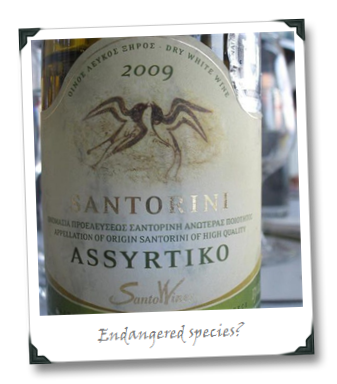 The result is vibrant Assyrtiko wines that (at their best) retain their citrus flower aromas and have decades of ageing potential thanks to a backbone of serious and vibrant acidity; another treasure that shouldn’t be lost. Nowhere on the island is the marriage of the traditional and the modern more evident than at the large co-op SantoWines. SantoWines’ union is one thousand members strong, and their large, gravity-fed winery is topped with terraces that serve as grape-drying beds for the production of Vin Santo. Its size, modern stainless steel equipment, international approach and three thousand ton / 500 thousand bottle capacity are in sharp contrast to the majority of Santorini wine producers with their tiny production, concrete stomping vats and large, old Russian oak barrels. Marketing Manager Stela Kasiola and Oenologist Nikos Varvargiros state the goal of SantoWines simply and straightforwardly: “Since 1992, our mission is to help save Santorini wine.” Their approach is to combine modern winemaking styles and packaging with the historic focus of Santorini’s ancient wine culture, and to embrace tourism (SantoWines’ panoramic view of the stunning caldera makes it one of the most popular tourist attractions on the island) while creating bottlings of indigenous island wines. The results, like their elegant 2003 Assyrtiko, are promising – and the future of Santorini’s wine culture may just lie in their hands (and tanks). The mission is arguably noble, but will it ultimately be successful? 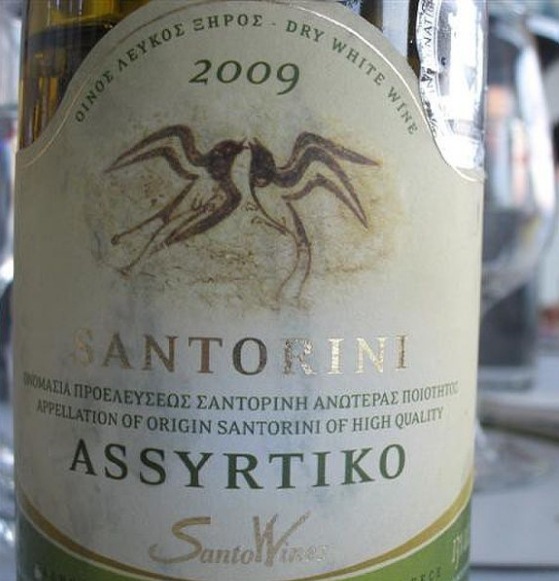 One promising sign is that the Greek wine community is conscious that they not only must wage a battle to preserve their ancient wine heritage on their own shores, but that they also must court the growing international community of wine lovers to overcome the challenges facing Greek wines in the global marketplace, and investments are being made on both fronts. Back at the taverna lunch, I was left with oodles of time to contemplate the deep history of winemaking on the island, and to sample just how well the unique wines of Santorini can be paired with food (particularly local tomatoes, fava beans, and seafood). I wondered how many future generations, Greek or otherwise, would get to do the same. 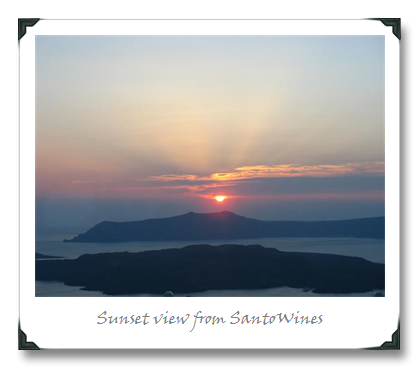 Only time, and a lot of hard work, will tell if the investments of today will pay off tomorrow, or if the unique wines and ancient traditions of winemaking on Santorini will fade away like the island’s fabled sunsets. We spent a wonderful day on Santorini last summer, and thought the Vin Santo from Volcan was a keeper (and I’m NOT talking abour the one sold in the plastic water jug). The Wine Museum was fun and interesting, though somewhat like being in a clown nightmare. This is my greatest fear. I have visited Santorini many times and have seen the encroachment of tourism on to the thriving wine business on the island. I agree Santorini may be the most beautiful place in the world and the wines from the island have improved greatly with time. 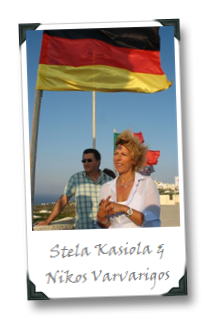 I support George's and others cause and fight to preserve the rich wine culture of Santorini. Thanks, all! Been offline most of the day, but wanted to at least say thanks for the comments. "… it’s the kind of wine that, after a fabulous meal, makes you feel ecstatic just to be alive and nearly brings tears of joy to your eyes." 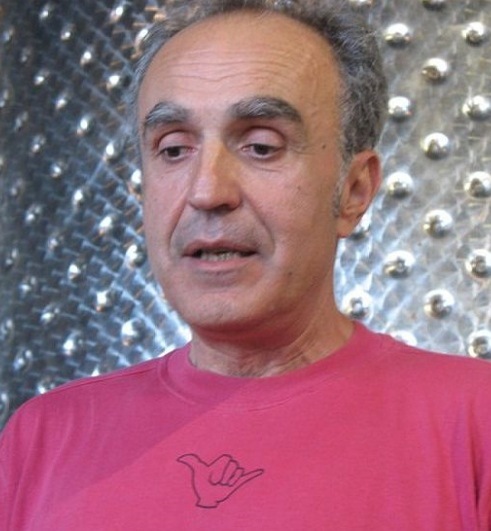 A great line Joe and hopefully the answer to, "will the Greek wine industry survive?" I have noticed the Greek wine folks are making some nice forays in modern marketing/publicity. 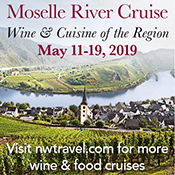 I know it's a challenge for all the global wine regions that are trying to become the hot "new" thing in the big markets, and I believe Greece's wines and the promotional campaigns will at the very least guarantee Greece/Santorini a foothold in the world markets during this decade. Let's hope it lasts another millennium. Thanks, Alana. Your comment comes at an interesting time because with the Born Digital thing I’ve been thinking about Santorini and wondering if any headway has been made to stem the tide of vineyard loss. It’s great to hear that they’re gaining some publicity purchase, hopefully it will manifest into international interest that helps bolster the survival of these wines.